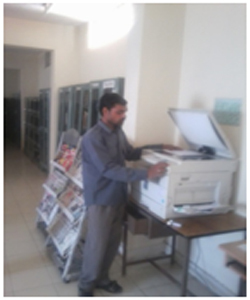 The college has a fully automated library with above 10,000 books catering to History of Education, History of Physical Education, Educational Philosophy, Educational Sociology, Education Psychology, Research Methodology & Statistics, Environmental Education, Population Education, Educational Technology, Educational Planning and Management, Physical Education, Sports & Yoga, Anatomy & Physiology, Sports Psychology, Health, Mental Hygiene, Value Education, Classroom Teaching Methodology, Microteaching, Lesson Planning, Educational Evaluation and many books for general and motivational reading. 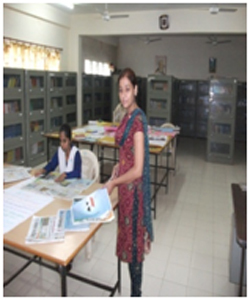 The library situated on the ground floor of the department for the benefit of physically challenged persons and pregnant ladies. The library is also decorated with many sets of encyclopedias, bilingual & multilingual dictionaries, periodicals, magazines, national & international journals and national & local newspapers. The reading room is well-ventilated, illuminated and peaceful for trainees to spend quality time in upgrading their personal knowledge and professional competencies through print resources. The web-library provides to all students, the facility to surf the internet and access to the unlimited resources of information on latest developments in all areas affecting human upgradement. The library has a well defined section to display new arrivals too. To encourage the habit of reading, the library staff analyses the accession rate of students every month and puts up on the notice board the names of the students who have accessed the library the maximum in that particular month as ‘Star of the Month’.